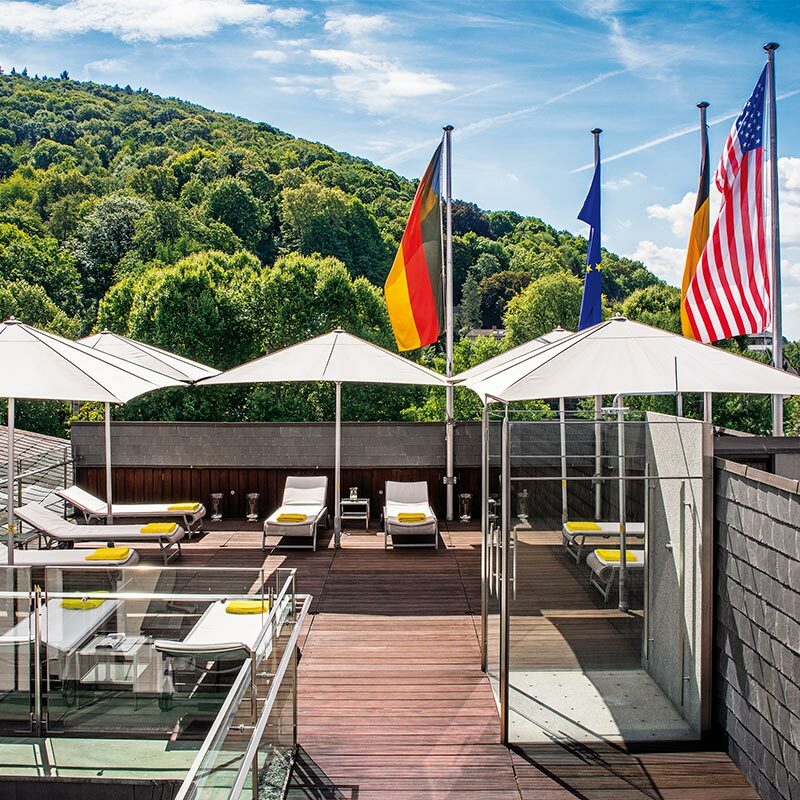 Pure recreation above the roofs of Heidelberg: Come and enjoy the Panorama Spa & Fitness. On 600 square metres, a pleasant variety awaits you – from fine beauty treatments and relaxing massages, to pool, sauna and steam room and to the latest fitness devices you will find everything here. Enjoy wellness and cosmetics in Heidelberg. Workout or Timeout – we are looking forward to providing a very special wellness experience for you. What happens without break is not permanent. We welcome you to our sun terrace with the unique panorama of the Odenwald forest. Take a seat on the terrace. Breathe deeply and let your eyes wander: to the Heidelberg castle, to the green of the forest, to the expanse of the Rhine and Neckar valley. All this is waiting for you in our Spa Hotel in Heidelberg. Is there anything nicer than starting you day off with a couple of strong lengths in the pool, when the morning sun makes the water sparkle? The pool in our wellness hotel in Heidelberg kindly invites you to do so. Enjoy this time, which belongs to you only. In case you as our hotel guest wish to use the pool earlier in the morning, please inform our colleagues on the reception. Our Spa area offers you to choose between the Finnish sauna, sanarium with color therapy and the steam room and to experience deepest relaxation. In case you wish to use the sauna earlier, please inform us one day in advance. Revitalize your body and soul: A relaxing bath with hot steam creates a soothing sensation to enhance your overall health and wellbeing. This bath is infused with essential oils to clear your airways, while also cleansing your skin with almost 100% humidity. Mona Schulte has been taking care of the hotel guests and Day-Spa guests in our Panorama Spa & Fitness with great passion since 2008. Together with her Spa team, she makes sure you feel comfortable and are able to dream and relax in our Panorama Spa & Fitness. Escape everyday life and let her spoil you. Our entire Spa team remains at your disposal for any questions. External guests are also always welcome at our Day Spa. You will find information regarding our equipment and offers under the following links.